I know in some of my previous posts I have said how much I like Mexican food, and pork. In my youth, I was not really an adventurous eater. Once I hit my teens, I started trying different things. After I had left home for college, I started eating at a well known Mexican cantina on the south side of Reno. That is where I first tasted Carnitas. It was awesome! So much porky flavor concentrated in each bite! Since then, I have tried them at other restaurants. They are all a tiny bit different from each other, but still delicious. My recipe is pretty basic. The use of OJ gives the pork a subtle sweetness. 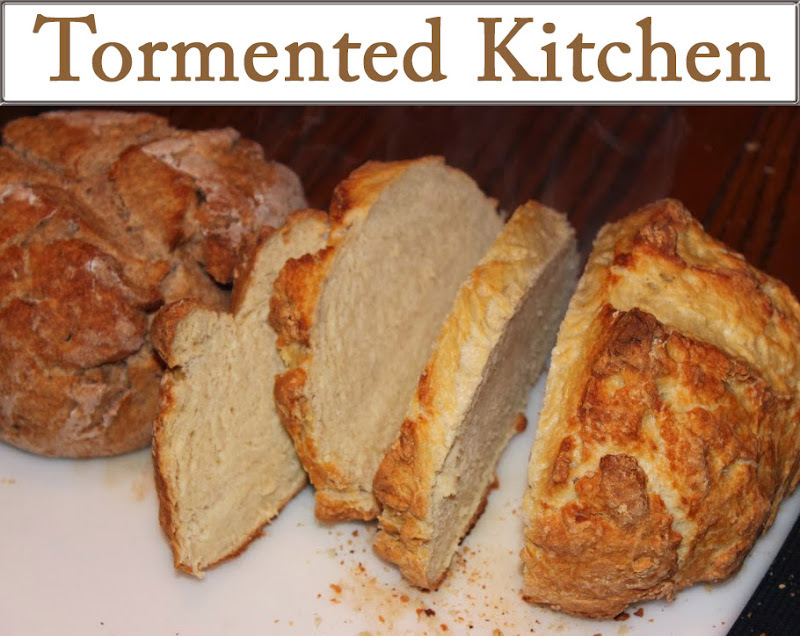 You may find other recipes that use lime juice or broth or stock. I will leave that decision up to you. 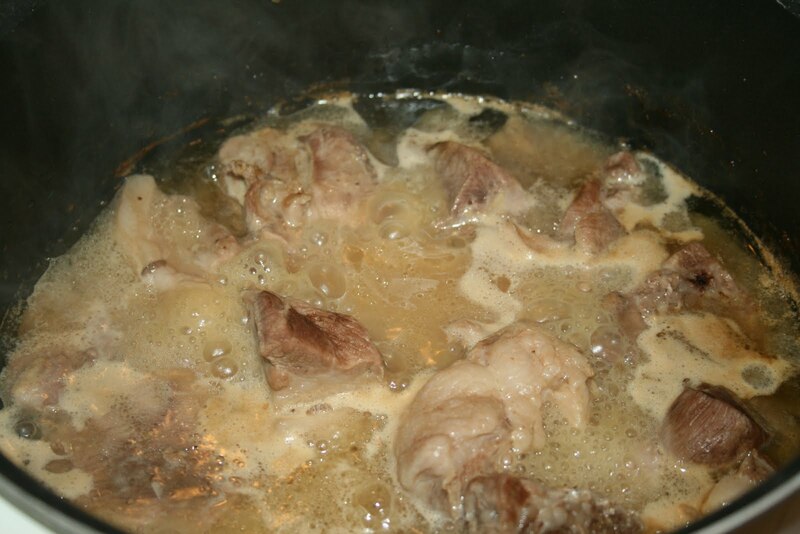 I have found simmering the meat and then frying it makes it very tender. To shred it, all you need to do is apply a little pressure with a fork. 1. Cut up the pork roast into large chunks up to 4 inches. Keep the fat on. 2. Combine all ingredients in a pot, about 4 quart size. Bring up to a boil and reduce to low heat. Simmer covered for 2 hours. Do not disturb the meat. Just let it do its own thing. Make sure to keep the temperature low. This tenderizes the meat. 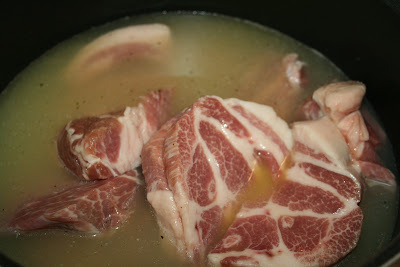 A vigorous boil at high temperatures willl actually toughen meat. 3. Now, after the two hours are up, increase the heat and remove the cover. Let it boil. You want to boil off any remaining water. This should take 30 minutes to an hour. 4. There will be some liquid in the pan. This is melted lard. 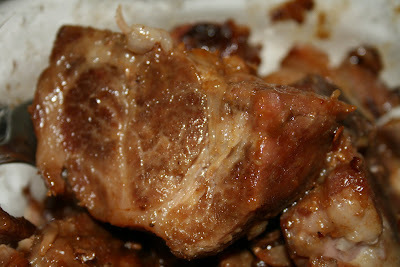 Continue cooking the pork until it has browned. 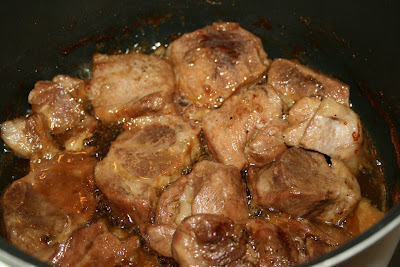 You may carefully flip the pork to brown it evenly. 5. Using a metal slotted spoon or mesh skimmer/strainer , carefully remove the pork from the hot lard. I put all of it in a small mixing bowl until I'm ready to serve. 6. Serve a few good-sized chunks with tortillas, salsa, sour cream, beans and rice. You may even want chopped cilantro, cheese, or guacamole.